Can be used with 8-1/2" x 11" paper, 16lb to 24lb. bond paper, 60gsm to 90gsm. Creates Letter and Half Fold. Folds 8-1/2" x 11" and 8-1/2" x 14" of 16lb to 28lb. bond, 60GSM to 105GSM. Handles and automatically feeds and folds a stack of documents, 3.5" x 5" to 8.5" x 14". 60GSM to 131GSM; 16lb to 90lb bond. Creates six different fold types: Letter fold, Half-fold, Z-fold, Double-Parallel, Gate and Church. Automatically feeds, folds and collects a stack of documents from 4" x 4" to 12" x 18". Max Speed: 12,000 sheets per hour. Pre-Marked for Three Popular Folds: Letter, Zig-Zag and Half fold in 11", 14" and 17" paper lengths. This is MyBinding video. If you’re looking for a paper folding machine to assist in folding statements, letters, documents or bulletins, you’ve come to the right place. 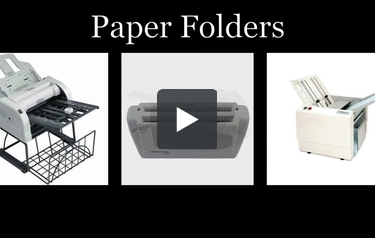 MyBinding.com is proud to carry a huge assortment of paper folding equipment in price ranges that are designed to meet almost any budget and almost any need. Our machines are used by churches, schools, offices, print shops, and can easily save your company time and money, so click through our site and see companies, such as MBM, Dynafold, Format, Paper Monster, you name it. If you get a little bit lost and not sure exactly what you need, give us a call. Our customer service would love to help you find exactly what your company needs. We’ve written a great article on how to choose the best paper folding machine and we have plenty of videos so you can watch the product in action before you buy it. When image matters, MyBinding.